It always amazes me when I find that a client’s home is filled with contractor-grade light fixtures that obviously date to when the home was first built. Changing lighting is one of the easiest ways to begin to update a home. Environmentally-friendly LED lighting. Many fixtures are now designed to accommodate LED light bulbs. LED creates a natural-looking light with very little heat. But, it can be difficult to determine how bright the light created by an LED bulb will be because they typically use lumens instead of watts to designate power. Table lamps and shades. New table lamp bases tend to be made of glass or metal and are almost a sculptural or artistic addition to a room. Look for more texture and an almost hand-made look to the new lamp bases. There is also a greater emphasis on shades, with some new table lamps sporting short bases with oversized shades. Ceiling mounted fixtures. Gone are the days when chandeliers were restricted to the dining room. Now you will find crystal chandeliers in kitchens and bathrooms. There are many new ceiling fixtures that are contemporary looking but will work well with many styles of furniture and other furnishings. There are also some interesting styles that take an industrial or retro tone, some of which use the “Edison” bulbs to complete the picture. Recessed lighting options. Recessed lighting with high-end trim gives a clean uncluttered look to your ceiling, but this kind of ceiling light must be placed carefully for maximum effectiveness. The goal is to have the light bounce off walls to provide a soft glow rather than “spotlights” on the floor. Recessed lighting also needs to be combined with lighting at other levels to create a livable room. Pendant lighting. Pendant lighting is being used in new and different design applications. You will find pendants providing light to bathroom mirrors. Sometimes low-hanging pendants substitute for table lamps on either side of a sofa. 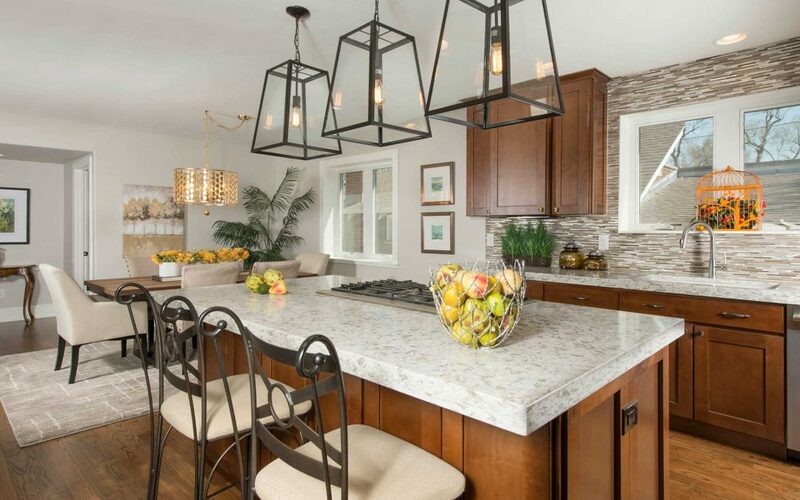 Clusters of pendants at different levels are used as an alternative to a typical chandelier. Care Award Winner– BASIC KITCHEN Care Award Winner– PRO BONO, ACCESSIBILITY Care Award Winner– LUXURY BATH! Ideas…But No Idea How to Execute Them? Call today to find out how you can work with Jeane on your next design project.